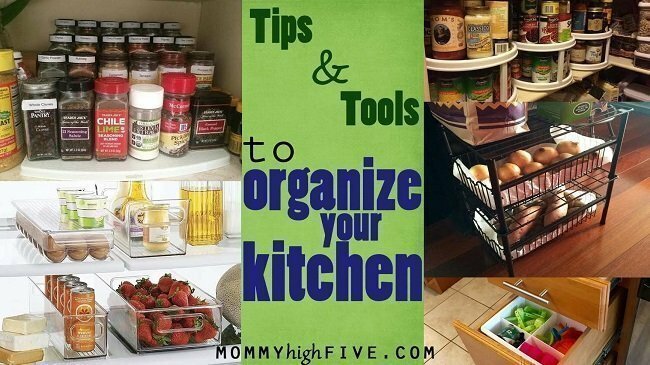 Need some help organizing your kitchen? I can definitely relate. And while I consider myself a pretty organized person lately, I feel like I’ve lost control and especially in my kitchen. So, I decided to make some changes and get organized. Here are ten tips that really helped me. When I feel stressed or overwhelmed, my natural instinct is to clean or organize a drawer or cupboard. It gives me just a little bit of control, even if it’s just over that jam-packed, mismatched Tupperware drawer. I’m not sure why it makes me feel so good, but that empowerment is crucial as a mom in a home full of kids. Organizing your kitchen doesn’t have to be expensive or time-consuming. In fact, if you organize, you’re likely to save time in the long-run. Here are some tools and tips I recommend for getting started. 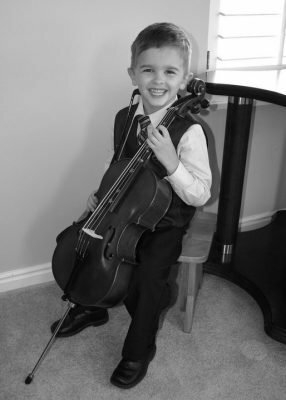 Most people, when overwhelmed, just shut the door to their messy room or overstuffed closet. Rather than searching for what they’re looking for, they just add it to that never-ending grocery list. They’ll tackle that mess post-holiday. I get it, and I’m here to help. 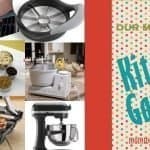 Here are a few inexpensive “tools” I use to get things under control before the overwhelm of the holidays takes over. All tools are budget-minded and under $25. If you cook or bake, spices are a must in the kitchen. Wouldn’t it be amazing if when a recipe calls for ginger, you go directly to your spice cabinet, open the cupboard, and immediately find the ginger for those cookies you’re making? 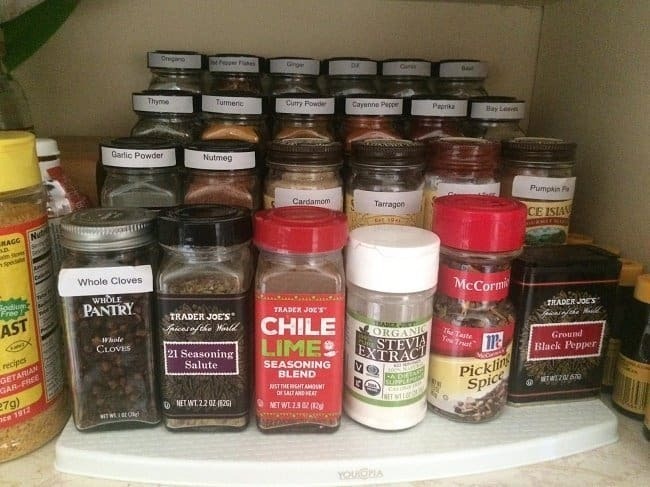 With a spice rack, there’s no more searching through a whole mess of spices, hoping you own the spice you’re looking for, and then hoping it’s not expired! Beyond just stacking your spices in an orderly manner, I like this 4-tier cabinet from YouCopia as it comes with 96 stickers to label the tops of your bottles. Since it’s often hard to see the label when stacking, this is a must. For installation, there’s no mounting required. Just set and forget. Obviously, it’s ideal for spices, but I’ve seen it used for soup cans as well. Turntables are one of my favorite multiform, multi-use tools. I use them in my medicine cabinets to easily find what I’m looking for, under bathroom sinks to corral hair products, counter spray, and toilet paper. I use them in the corner of my pantry to make better use of that hard to reach space, and in my kitchen cupboards for easy access to often-used items, like salt, pepper, toothpicks, and extracts. These cabinet turntables from Copco are fantastic. They come in 9, 12, 12 inch 2-tier, and 18-inch varieties for various areas in your kitchen cabinets or pantry. They have a non-skid surface for keeping everything in place and allow you to maximize your usable storage. If you’re on a budget and want to save money, the 9-inch variety is occasionally cheaper in bulk. Be sure to calculate it out before your purchase as this isn’t always the case. Using containers in my fridge was a game changer. My fridge felt like it doubled in size and kept everything more organized and clean! My kids easily pull one container out at a time, to grab a yogurt, juice boxes, or string cheese. I group my salad dressings together in one, and small jars of like items in another. I know exactly where to find each item. NO more moving, removing, and searching trying to find what I need. Cleaning the fridge is easier too as I just remove each container, wash, and replace, and any spill is contained. 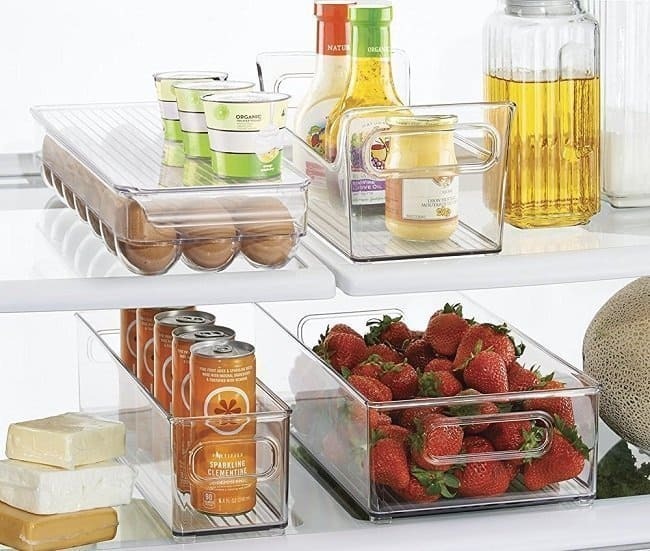 Once you use these clear freezer organizer bins, I promise you that organizing your fridge will become much less of a burden. There are lots of inexpensive freezer storage organizers out there, but the ones I’d use are the clear bins from Metro Decor. They’re easy on your budget, BPA-free, and clean up easily when you hand wash them. They’re also sturdy enough that they won’t get tossed around. For the best use of your space, be sure to mix and match these by using the bin, condiment caddy, egg holder, and water bottle holder bins. Look under the kitchen sink, and often you’ll see a big, huge, and may I add dirty, waste of space. This spot is often home to miscellaneous things like cleaning supplies, sponges, trash bags, paper towels, and dishwashing soap…. 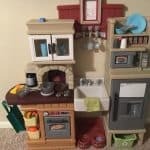 If you add a shelf and drawer, you can easily contain all those little odds and ends. It makes the vertical space usable, doubling your storage. DecoBros has a couple of really good options here including their Stackable Under Sink Cabinet Sliding Basket (shown above) and Tier 2 Expandable Shelf Organizer. They’re inexpensive, at just under $25, and make organizing under your sink a whole lot easier. The organizers are also sturdy and won’t shift around like a lot of others I’ve seen. 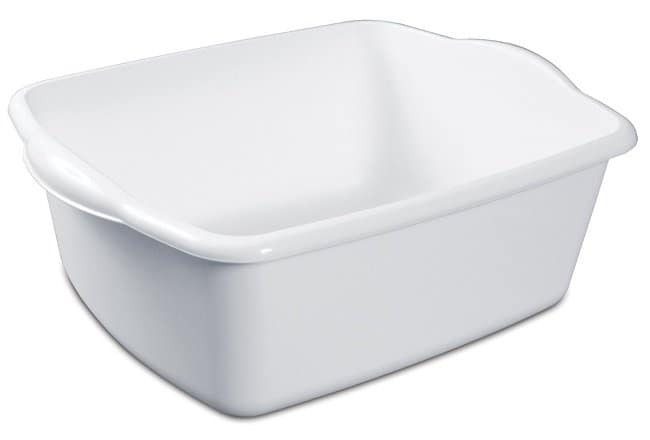 For a very cheap fix purchase large plastic white tubs and use them under the sink like drawers. And, if something spills it’s contained to the tub that is easy to remove, wash, and replace. Pots, pans, and lids…everyone has them. And they have to go somewhere. 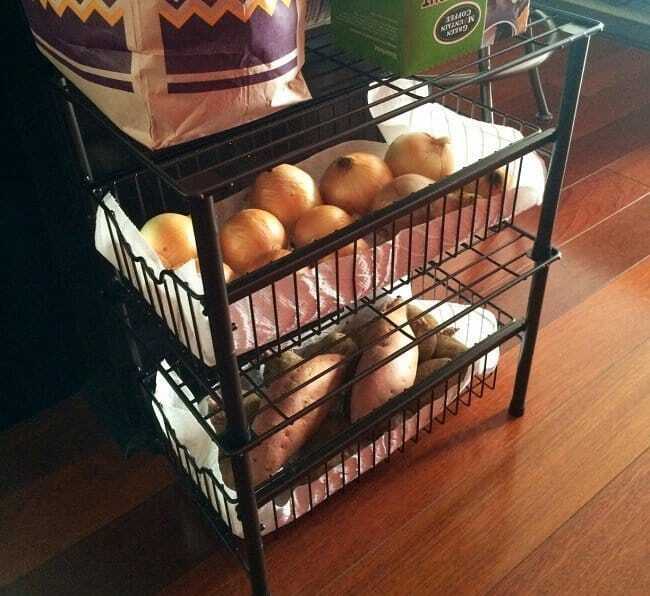 Organize them in a rack and bam! The pot or lid is now easily accessible and takes up much less room than those thrown randomly in a drawer or cupboard. Another great storage organizer from Deco Brothers is this Pan Organizer Rack. 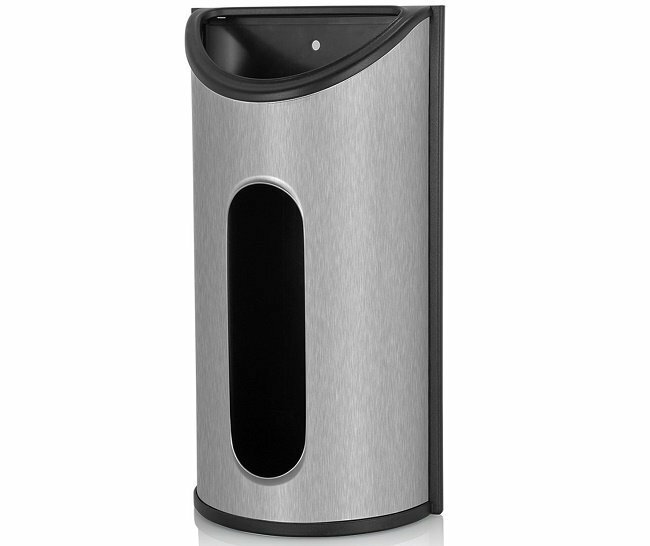 It’s fairly cheap at around $18 and accommodates up to five pans when you install it vertically (four horizontally). 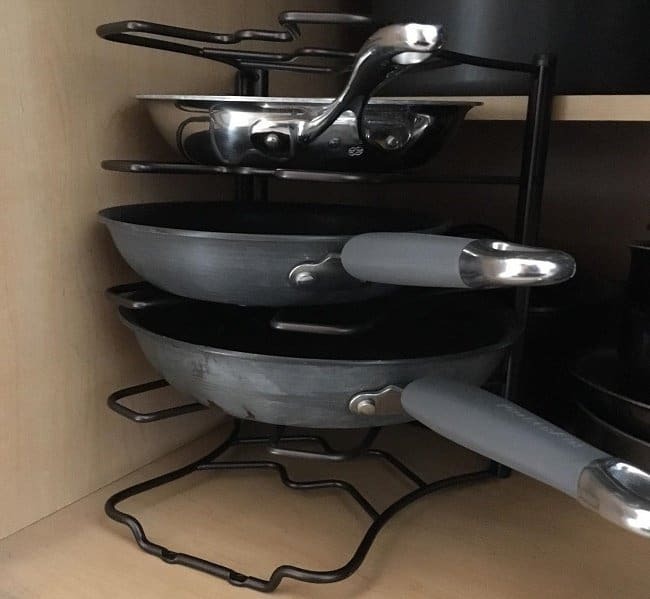 It’s a great way to take those awkward pans out of your drawers and store them neatly. Having a specific place where they can go is half the battle. It’s definitely sturdy enough to hold them in place. Still, you can screw the rack in if you don’t want it to move at all. If you’re like me, and have about 1 million empty grocery sacks, this dispenser keeps them all together in one place where you can grab one at a time as needed. Contained and accessible; win, win. There are a ton of plastic wall grocery organizers out there but the Fortune Candy Organizer is the one I’m recommending. 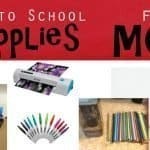 It’s inexpensive, at just under $30, holds up to 30 bags, and can be screwed in or adhered to your wall. I recommend you take the extra time to screw it in as here in our house adhesive never seems to hold up. Kids grab and tug at objects and just make a mess of it otherwise. Get that broom, mop, and duster, off that floor and out of the way. Such a quick and easy fix that opens up space in that pantry or broom closet, so you can use that floor space for things that actually belong on the floor. If you’re looking for a sturdy and good organization system, take a look at Rockbirds T56 hook. 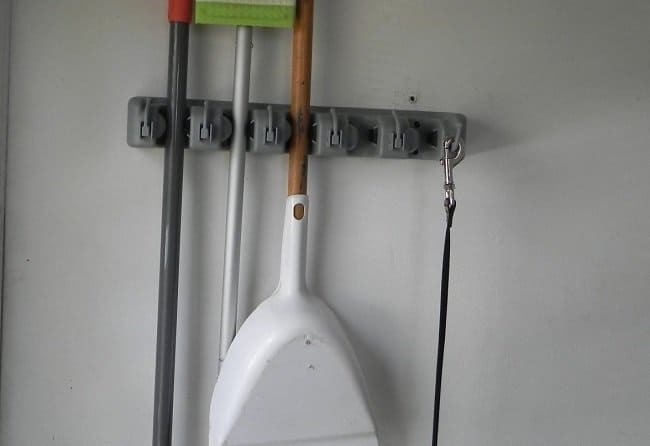 It’s a lot easier to use than those nails you’ve probably been using and the roll balls automatically adjust for the thickness and grip of your broom, mop, or whatever you want to hang. In addition, each of the retractable balls can hold up to 12 pounds of weight, so you can hang just about anything. Better yet, at just $11, it’s cheaper than what you’ll likely find at Home Depot or Wal-Mart. A large or small space not contained usually means…mess. Add compartments to that space, and voila, an organized place for spatulas, rubber scrapers, measuring spoons, cups, paper clips, and pencils… you get the idea. Adding compartments keeps all the big or small things from rolling around, making it easy to find just what you’re looking for. 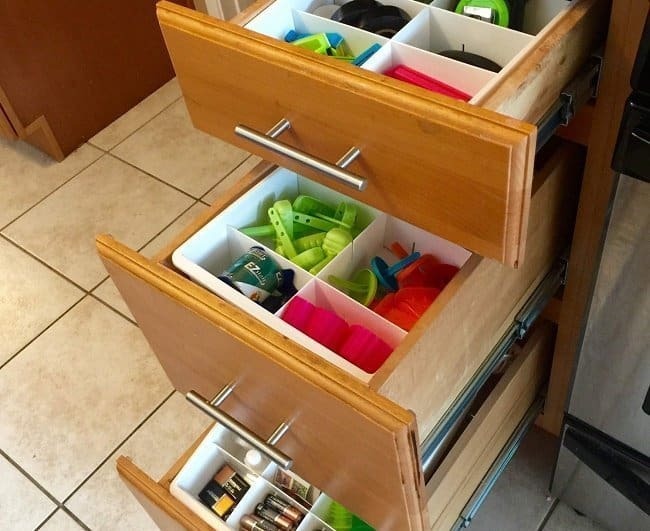 These adjustable drawer dividers from Uncluttered Designs are awesome! They come with 6 long and 12 short dividers that you use to make up to 45 cells in one spot. The dividers are stiff and easy to keep in place. Putting these in your drawers will get rid of any “junk accumulating” you might have had in the past. If you’re looking to save the most money, you’ll want to buy them in sets of 3, as you basically get one for free. Want everything to stay in place? 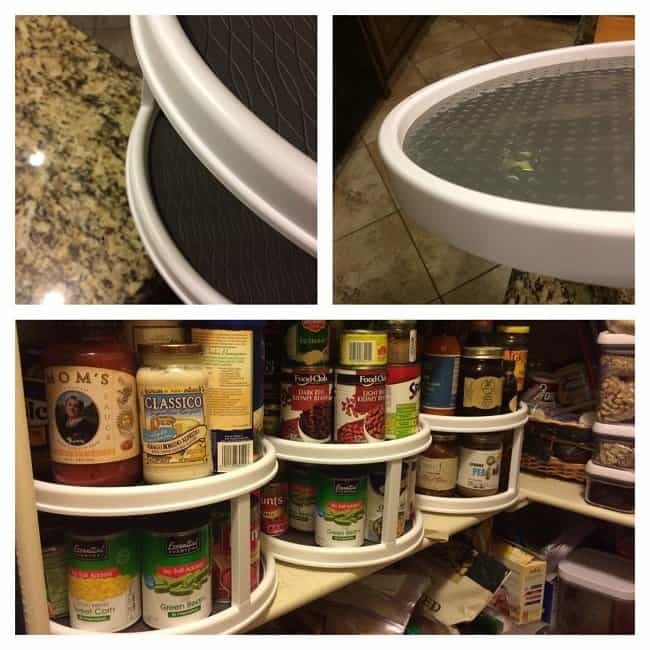 A really smart and easy way is to use shelf liner. It’s cheap, has a non-slip grip surface, and is easy to cut. There are a lot of good brands of shelf liner out there but one I like is the Duck Brand Easy Liner. It’s easy to use and thicker than most shelf liners. It’s also cheap, which is a plus when you’re trying to install it in several places. 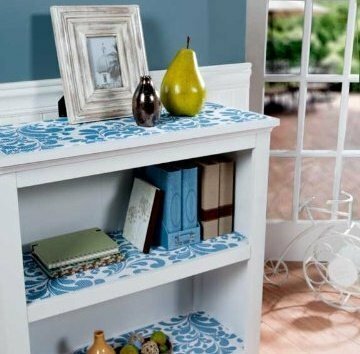 For those who don’t simply want to use white, there are 10 different colors and patterns you can use to organize your space. This includes the swirling-type pattern you see in the picture. Getting organized doesn’t have to be complicated or expensive. It’s using the right tools to make your space work for you. “A place for everything, and everything in its place”, and getting organized can help alleviate some of the stress that the holidays often bring.